If you are planning to visit Herefordshire, use our website to search for the perfect place to sleep including bed and breakfasts, hotels, holiday cottages, group accommodation, self catering, guest houses, boutique hotels, camping and glamping before you visit. Southbank House is situated in a quiet area of Hereford and is an elegant Victorian building Just 10 minutes’ walk from the city centre, Southbank House is surrounded by mature gardens. Named as Hereford in Bloom Best Gardens 2017, guests can enjoy plenty of private seating areas during their stay in this very peaceful and beautiful setting. Dating back to 1877, Southbank House has retained many of its original Victorian features, including the service bells in the hallway, fireplaces, high ceilings, ornate ceiling roses and coving. This bed & breakfast in Hereford has five bedrooms all with en-suite facilities and designer toiletries and comfortable beds. The bedrooms are light and airy, with some giving fabulous views over the Cathedral, the city and the Black Mountains beyond. Guests benefit from Egyptian cotton linen, flat screen TV’s with Freeview, tea & coffee making facilities, iron & ironing board, hair dryer, a writing desk and easy chairs. There is a large, well-lit private car park in the grounds of the house and the rail and coach links are a brisk five minute walk from the property. Free Wifi is available throughout. Part of the White Heron Properties portfolio and set in beautiful north Herefordshire in a wonderfully private location, The Sherriffs Holiday House is a 4 Star Grade ll listed Queen Anne House and is located on the Whittern Estate. A holiday at The Sherriffs with family or friends could be the perfect party house for your get together. The accommodation comprises three large reception rooms with a beautiful dining room, drawing room and elegant sitting room. It also boasts a large family kitchen. Upstairs there are 8 large bedrooms with 6 bathrooms (4 en-suite). Sleeps 18. Well behaved pets allowed. See also Field Cottage The Colloquy Gardeners Cottage The Forge Book direct. Why not make the most of your stay and ask about British Cassis tours & tasting. email info@whiteherondrinks.co.uk or telephone 01544 340241. Sugar & Loaf offers a carefully selected collection of places to stay across the Welsh Borders that have that something extra-special about them. Explore Herefordshire and beyond, from the deep valleys of the River Wye to its charming cluster of black and white towns. Each of their places to stay offers a luxury escape from every day, something individual, unique and truly special. Among the collection you’ll find cute shepherd’s huts, holiday homes with handcrafted hot tubs, treehouses and cosy barns. The vast majority of the accommodation welcomes pets, and each offers a home-from-home experience with everything you could need during your break, whether you’re looking to really treat yourself or get back to basics and immerse yourself in nature. See the full collection on their website, where you can also see full prices and availability. Trumpet Inn Campsite is perfectly situated for visiting the beautiful Herefordshire countryside. Close to popular tourist destinations such as Eastnor Castle, the market towns of Ledbury, Hereford and Ludlow, The Malvern Hills and much more. Able to accommodate Caravans, Motor-homes and Tents. Attached to a 16th century black & white pub. Open daily from 12pm. Food is served weekdays 12-2.30/6pm-9pm, Saturday 12-9pm and Sunday 12-5pm. Onsite facilities include toilet, shower, picnic area and wash-up facilities. The Trumpet inn is family friendly and also welcome dogs. Enjoy your stay at The Trumpet for £13 per without electric or £16 with electric hook up. (Prices are per pitch per night) See also The Trumpet Inn. Perfect for get togethers, whatever the occasion The Hyde is Grade II* and sleeps 12 in the main house and a further 8 in the adjacent cottage (only a few feet away). Both have been skilfully restored to a high standard with the help of English Heritage. Meticulous attention to detail and craftsmanship have revealed the historical spirit of this 13th Century hall house. Set amidst the idyllic countryside of the Herefordshire-Worcerstershire borders, at the end of the mile long drive within the secluded Netherwood Estate, The Hyde nestles around a courtyard bordered by an imposing Elizabethan barn. The Hyde offers flexible space which is perfect for large family and friend get togethers and holidays where peace and privacy are key, yet with plenty of space for fabulous entertaining or to enjoy cosy quiet areas, surrounded by beautiful countryside. Also a sheltered garden with lots for all ages including a maze, a tennis court and a wendy house. Sleeps 20 in 10 bedrooms. There are four self catering holiday cottages at Luntley Court Farm Cottages providing first class accommodation. Tastefully converted from sixteenth century farm buildings located on a working livestock farm with fishing rights on the river Arrow. The holiday cottages are situated in the rolling hills of North Herefordshire, in the heart of the Welsh Marches, between the historic towns of Ludlow and Hay-On-Wye. Situated in the hamlet of Luntley, the farm is on the black & white medieval trail of north Herefordshire and the village of Pembridge itself is known as the ”Jewel in the Crown” of the ”Black & White Village Trail”. These beautiful cottages are the pride and joy of David & Sandra Owens, who have lovingly maintained each one to a very high standard. Each is fully equipped with electric cooker; washing machine; microwave; dishwasher and crockery making them perfect for a self catering holiday in Herefordshire. Towels and bed linen are included in the rental as is water and electricity. Each lounge has a colour TV, DVD player and iPod docking station. Broadband wireless internet connection available for your laptop. Sorry but no pets allowed! If you are looking to leave the hustle and bustle of everyday life behind, Raycombe Farm Glamping is the place for you. Veiled in ancient woodland and surrounded by flower filled meadows, offering incredible views across East Herefordshire you can choose to sleep in the loft of the converted timber barn space or the delightful remote yurt. Both are beautifully furnished with antiques, linen and towels and you will find all the equipment you need whether you want to use the rustic outside kitchen and BBQ by the yurt or the well-equipped shared kitchen in the nearby barn to cook up whatever you fancy and at whatever time you like. Choose alfresco or eat in the spacious dining room to enjoy your food. The dining room doors in the barn open up fully to reveal a large wooden deck, the perfect place to enjoy a relaxing drink and catch the perfect setting you are surrounded by. After a good night’s sleep, take peaceful and tranquil nature walks or run around playing in the fields in your wellies. The choice is yours and there are no rules or time keeping here! Here you can relax, unwind and feel like kids again. Perfectly based to explore the lush countryside of both England and Wales, Herefordshire is one of the UK’s most beautiful counties, with holidaycottages.co.uk offering over a hundred holiday cottages across the region. Whether you’d like to explore the historic city of Hereford, wander around market towns such as Leominster, soak up the serene scenery of the River Wye or escape to the verdant landscapes of the Welsh Marches, they have a wide variety of hand-picked holiday cottages and places to stay to choose from. Their wide and varied collection encompasses everything from traditional thatched cottages to spacious converted barns, quirky shepherds’ huts and log cabins in the forest. If you’re planning to go away just as a couple, or even if you’re planning a big group getaway, there will be something to suit your needs, with some properties sleeping up to 18 people. Several of the properties on offer are dog-friendly, while some also come equipped with brilliant extra features such as log burners, swimming pools and hot tubs. 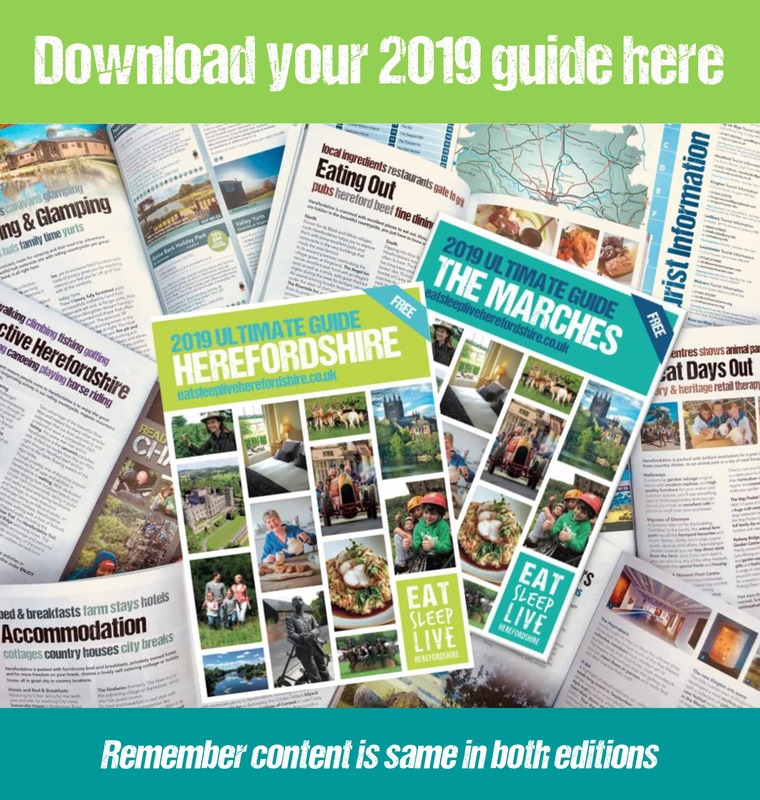 Head to their website to see the full collection and find your perfect holiday in Herefordshire. As beautiful inside as it is out The Freeth is a pretty Georgian farmhouse with wonderful views across the Herefordshire countryside, it is beautiful, comfortable and well equipped and has a private indoor heated swimming pool. The Freeth was originally a hunting lodge on the edge of the ancient Netherwood Estate and its medieval deer park. It has now been lovingly restored and transformed into a stylishly furnished and incredibly comfortable house with no detail overlooked. It is hidden away up a no-through road surrounded by some of the most unspoilt, beautiful countryside imaginable. It has a very large, pretty garden as well as a private indoor heated swimming pool. So, it is perfect for a slightly smaller get-together, or if you want additional accommodation to The Hyde nearby. Sleeps 18. Harlequin Bed & Breakfast offers luxury en-suite accommodation in a stunning and totally renovated and refurbished family home a few minutes’ walk from the centre of the historic market town of Ledbury. There are two beautifully appointed guest rooms with en-suite bathrooms, and all with brand new luxury beds, soft furnishings and bath linen. Each room has tea and coffee making facilities and free-view TV. The owners take great pride in hospitality and look forward to welcoming all guests to the chef’s table for a sumptuous breakfast where every effort is made to use only the best and freshest locally sourced ingredients. There is also superfast free Wi-Fi for all guests ample parking space. With regret we are unable to accept children under the age of 12 or dogs/pets. Ledbury is an attractive market town in rural Herefordshire and has a good selection of shops, restaurants and other attractions. The city of Hereford and the towns of Ross-on-Wye, Cheltenham, Ludlow and Monmouth are all within easy reach. More locally there is Eastnor Castle and the beautiful Malvern Hills. All this and more makes staying at Harlequin B&B a great base to start your adventures! Book direct. If you’re looking for a secluded hideaway nestling in gorgeous north Herefordshire countryside then Green Lane Carriage is just perfect. Surrounded by beautiful orchards and with spectacular views towards the Black Mountains this vintage railway carriage is both quirky and an absolute delight. It may be harking back to bygone times but it is furnished to an exceptionally high standard and includes lots of lovely home comforts and a wonderful wood-burner to take away the chill of an evening. Great for families the carriage sleeps 4, 2 adults and 2 children and is within easy reach of historic Hereford City, the ‘town of books’ Hay on Wye, arty Kington and the Black and White village trail. A great base too for walking or cycling. Enjoy a warm welcome from owners Clare and Steve who also run the Orgasmic Cider Company, producing traditional Herefordshire cider and perry and who are always happy to show you around and organise tastings. This quiet, peaceful country retreat is the ideal place to come and relax and sample life in the slow lane. Book here. A former Cider House, converted to an oak beamed, first floor, self-catering flat on a traditional farm, Woonton Court Farm offers offers, 3-Stars *** Commended, first-floor accommodation for up to four guests. The master bedroom has one king-size bed and one single, with wash basin; and the second bedroom has twin beds (for one adult or two children), with adjacent bathroom. The characterful sitting room has a television and kitchen area with all facilities. Central Heating, linen and electricity included. Laundry, cot, high chair, baby-sitting and groceries available. Patio garden and ample parking. Near to visitor attractions in Herefordshire, Shropshire, Worcestershire, Tenbury, Ludlow and Leominster. Also see Woonton Court Farm Camping & Caravanning. Woonton Court Farm is a secluded camping and caravan site with hard standings and electric hook up, surrounded by Herefordshire woodland and wildlife. Enjoy Lovely walks and rural peace. Situated on a rural farm, you are invited to walk the farm (strong footwear advised), see the animals, collect and enjoy free range eggs and of course meet Lily the farm donkey. Bring your bike to cycle round the lovely country lanes and enjoy the stunning views surrounding you in all directions. Open all year. Dogs welcome by arrangement. Coming soon – Bring your horse on holiday! Check the website for further details. Near to visitor attractions in Herefordshire, Shropshire, Worcestershire, Tenbury, Ludlow and Leominster. Also see Woonton Court Farm Self Catering Holiday Cottage. Find great accommodation in Herefordshire from gorgeous farmhouse bed and breakfasts in Herefordshire, Herefordshire holiday cottages and boutique Hereford City hotels, you’ll find a huge variety of places to stay for your short break or family holiday in our beautiful county.